This article is about the term for an ethnic group used in Southern Africa. For other uses, see Color (disambiguation). For usage of the term outside Southern Africa, see Colored. Coloureds (Afrikaans: Kleurlinge) are a multiracial ethnic group native to Southern Africa who have ancestry from more than one of the various populations inhabiting the region, including Khoisan, Bantu, Afrikaner, English, Austronesian, East Asian or South Asian. Because of the combination of ethnicities, different families and individuals within a family may have a variety of different physical features. Coloured people as a proportion of the total population in South Africa. Density of the Coloured population in South Africa. A genetic clustering of South African Coloured and five source populations. Each vertical bar represents individual. In the Western Cape, a distinctive Cape Coloured and affiliated Cape Malay culture developed. In other parts of Southern Africa, people classified as Coloured were usually the descendants of individuals from two distinct ethnicities. Genetic studies suggest the group has the highest levels of mixed ancestry in the world. Mitochondrial DNA studies have demonstrated that the maternal lines of the Coloured population are descended mostly from African Khoisan women. This ethnicity shows a gender-biased admixture. Male lines have been primarily African, Asian Indian, and Southeast Asian. 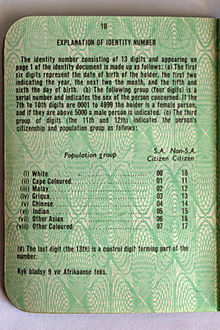 The apartheid-era Population Registration Act, 1950, and subsequent amendments, codified the Coloured identity, and defined its subgroups. Indian South Africans were initially classified under the act as a subgroup of Coloured. The Coloured community is predominantly descended from numerous interracial sexual unions, primarily between Western European men and Khoisan or mixed-race women in the Cape Colony from the 17th century onwards. In KwaZulu-Natal, the Coloured possess a diverse heritage including British, Irish, German, Mauritian, Saint Helenian, Indian, Xhosa and Zulu. Zimbabwean Coloured are descended from Shona or Ndebele, British and Afrikaner settlers, as well as Arab and Asian people. Griqua, on the other hand, are descendants of Khoisan women and Afrikaner Trekboers. Despite these major differences, as both groups have ancestry from more than one naturalised racial group, they are classified as coloured in the South African context. Such mixed-race people did not necessarily self-identify this way; some preferred to call themselves black or Khoisan or just South African. The Griqua were subjected to an ambiguity of other creole people within Southern African social order. According to Nurse and Jenkins (1975), the leader of this “mixed” group, Adam Kok I, was a former slave of the Dutch governor who was manumitted and provided land outside Cape Town in the eighteenth century (Nurse 1975:71). With territories beyond the Dutch East India Company’s administration, Kok provided refuge to deserting soldiers, runaway slaves, and remaining members of various Khoikhoi tribes. In South Africa and neighbouring countries, the white minority governments historically segregated Africans from Europeans after settlement had progressed. They classified all such mixed race people together in one class, despite their numerous ethnic and national differences in ancestry. The imperial and apartheid governments categorized them as Coloured. In addition, other distinctly homogeneous ethnic groups also traditionally viewed the mixed-race populations as a separate group. During the apartheid era in South Africa of the second half of the 20th century, the government used the term "Coloured" to describe one of the four main racial groups it defined by law. This was an effort to impose white supremacy and maintain racial divisions. Individuals were classified as white South Africans (formally classified as "European"), black South Africans (formally classified as "Native", "Bantu", or simply "African", and comprising the majority of the population), Coloureds (mixed-race), and Indians (formally classified as "Asian"). Coloured people may have ethnic ancestry from Indonesia, mixed-race, and Khoisan ancestry. The Apartheid government treated them as one people, despite their differences. 'Cape Muslims' were also classified as 'coloured.' They generally have Indonesian and black ancestry, as many Indonesian slaves had children with African partners. Many Griqua began to self-identify as Coloureds during the apartheid era, because of the benefits of such classification. For example, Coloureds did not have to carry a dompas (an identity document designed to limit the movements of the non-white populace), while the Griqua, who were seen as an indigenous African group, did. In the 21st century, Coloured people constitute a plurality of the population in the provinces of Western Cape (48.8%), and a large minority in the Northern Cape (40.3%), both areas of centuries of mixing among the populations. In the Eastern Cape, they make up 8.3% of the population. Most speak Afrikaans, as they were generally descendants of Dutch and Afrikaner men and grew up in their society. About twenty percent of the Coloured speak English as their mother tongue, mostly those of the Eastern Cape and KwaZulu-Natal. Virtually all Cape Town Coloured are bilingual. Some can comfortably codeswitch between Kaapse taal (a creolized dialect of Afrikaans spoken mostly in the Cape Flats) and suiwer Afrikaans (formal Afrikaans as used in schools and media), and South African English. 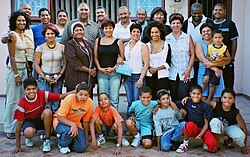 At least one genetic study indicates that Cape Coloureds have ancestries from the following ethnic groups; not all Coloureds in South Africa had the same ancestry. The Malagasy component in the Coloured composite gene pool is itself a blend of Malay and Bantu genetic markers. This genetic admixture appears to be gender-biased. A majority of maternal genetic material is Khoisan. The Coloured population is descended predominantly from unions of European and European-African males with autochthonous Khoisan females. Coloured people played an important role in the struggle against apartheid and its predecessor policies. The African Political Organisation, established in 1902, had an exclusively Coloured membership; its leader Abdullah Abdurahman rallied Coloured political efforts for many years. Many Coloured people later joined the African National Congress and the United Democratic Front. Whether in these organisations or others, many Coloured people were active in the fight against apartheid. The political rights of Coloured people varied by location and over time. In the 19th century they theoretically had similar rights to Whites in the Cape Colony (though income and property qualifications affected them disproportionately.) In the Transvaal Republic or the Orange Free State, they had few rights. Coloured members were elected to Cape Town's municipal authority (including, for many years, Abdurahman). The establishment of the Union of South Africa gave Coloured people the franchise, although by 1930 they were restricted to electing White representatives. They conducted frequent voting boycotts in protest. Such boycotts may have contributed to the victory of the National Party in 1948. They carried out an apartheid programme that stripped Coloured people of their remaining voting powers. Coloured people were subject to forced relocation. For instance, the government relocated Coloured from the urban Cape Town areas of District Six, which was later bulldozed. Other areas they were forced to leave included Constantia, Claremont, Simon's Town. Inhabitants were moved to racially designated sections of the metropolitan area on the Cape Flats. Additionally, under apartheid, Coloured people received educations inferior to that of Whites. It was, however, better than that provided to Black South Africans. J. G. Strijdom, known as the Lion of the North, worked to restrict Coloured rights. He removed their ability to exercise their franchise. Strijdom's government expanded the number of Senate seats from 48 to 89. All of the additional 41 members hailed from the National Party. It increased its representation in the Senate to 77 in total. The Appellate Division Quorum Bill increased the number of judges necessary for constitutional decisions in the Appeal Court from five to eleven. Strijdom, knowing that he had his two-thirds majority, held a joint sitting of parliament in May 1956. The entrenchment clause regarding the Coloured vote, known as the South African Act, was amended. Coloureds were placed on a separate voters' roll. They could elect four whites to represent them in the House of Assembly. Two whites would be elected to the Cape Provincial Council, and the governor general could appoint one senator. Both blacks and whites opposed this measure. The Torch Commando was very prominent, while the Black Sash (white women, uniformly dressed, standing on street corners with placards) also made themselves heard. Many Coloureds refused to register for the new voters' roll. The number of Coloured voters dropped dramatically. In the next election, only 50.2% of them voted. They had no interest in voting for white representatives—an activity which many of them saw as pointless. Under the Population Registration Act, as amended, Coloureds were formally classified into various subgroups, including Cape Coloureds, Cape Malays and "other coloured". A portion of the small Chinese South African community was also classified as a coloured subgroup. In 1958, the government established the Department of Coloured Affairs, followed in 1959 by the Union for Coloured Affairs. The latter had 27 members and served as an advisory link between the government and the Coloured people. The 1964 Coloured Persons Representative Council turned out to be a constitutional hitch[clarification needed] which never really got going. In 1969, the Coloureds elected forty onto the council to supplement the twenty nominated by the government, taking the total number to sixty. Following the 1983 referendum, in which 66.3% of white voters supported the change, the Constitution was reformed to allow the Coloured and Asian minorities limited participation in separate and subordinate Houses in a tricameral Parliament. This was part of a change in which the Coloured minority was to be allowed limited rights, but the Black majority were to become citizens of independent homelands. These separate arrangements were removed by the negotiations which took place from 1990 to provide all South Africans with the vote. During the 1994 all-race elections, some Coloured people voted for the white National Party. The National Party recast itself as the New National Party, partly to attract non-White voters. This political alliance, often perplexing to outsiders, has sometimes been explained in terms of the culture and language shared by White and Coloured New National Party members, who both spoke Afrikaans. In addition, both groups opposed affirmative action programmes that might give preference to non-Coloured Black people, and some Coloured people feared giving up older privileges, such as access to municipal jobs, if African National Congress gained leadership in the government. Since the late 20th century, Coloured identity politics have grown in influence. The Western Cape has been a site of the rise of opposition parties, such as the Democratic Alliance (DA). The Western Cape is considered as an area in which this party might gain ground against the dominant African National Congress. The Democratic Alliance drew in some former New National Party voters and won considerable Coloured support. The New National Party collapsed in the 2004 elections. Coloured support aided the Democratic Alliance's victory in the 2006 Cape Town municipal elections. Patricia de Lille, former mayor of Cape Town and founder of the now-defunct Independent Democrats, does not use the label Coloured but many observers would consider her as Coloured by visible appearance. The Independent Democrats party sought the Coloured vote and gained significant ground in the municipal and local elections in 2006, particularly in districts in the Western Cape with high proportions of Coloured residents. The firebrand Peter Marais (formerly a provincial leader of the New National Party) has sought to portray his New Labour Party as the political voice for Coloured people. Coloured people supported and were members of the African National Congress before, during and after the apartheid era: notable politicians include Ebrahim Rasool (previously Western Cape premier), Beatrice Marshoff, John Schuurman and Allan Hendrickse. The Democratic Alliance won control over the Western Cape during the 2009 National and Provincial Elections and has since brokered an alliance with the Independent Democrats. The Congress has had some success in winning Coloured votes, particularly among labour-affiliated and middle-class Coloured voters. Some Coloureds express distrust of the ANC with the comment, saying that the Coloured were considered "not white enough under apartheid, and not black enough under the ANC." In the 2004 election, voter apathy was high in historically Coloured areas. According to the Christian Science Monitor, around 4 in 100 South African marriages occur between members of South Africa's major ethnoracial groups, with trepidation toward interracial marriage polling far lower among black South Africans than among white South Africans. It is not known how many descendants of post-apartheid interracial relationships identify as Coloured or with the Coloured minority group. Racial-demographic map of South Africa published by the CIA in 1979, with data from the 1970 South African census. The term Coloured is also used in Namibia, to describe persons of mixed race, specifically part Khoisan, and part European. The Basters of Namibia constitute a separate ethnic group that are sometimes considered a sub-group of the Coloured population of that country. Under South African rule, the policies and laws of apartheid were extended to what was then called South West Africa. In Namibia, Coloureds were treated by the government in a way comparable to that of South African Coloureds. In Zimbabwe and to a lesser extent Zambia, the term Coloured or Goffal was used to refer to people of mixed race. Most are descended from mixed African and British, or African and Indian, progenitors. Some Coloured families descended from Cape Coloured migrants from South Africa who had children with local women. Under Rhodesia's predominantly white government, Coloureds had more privileges than black Africans, including full voting rights, but still faced social discrimination. The term Coloured is also used in Swaziland. As far as family life, housing, eating habits, clothing and so on are concerned, the Christian Coloureds generally maintain a Western lifestyle. Marriages are strictly monogamous, although extramarital and premarital sexual relationships often lead to social problems. Among the working and agrarian classes, permanent relationships are often officially ratified only after a while if at all. The average family size of six does not differ from those of other Western families and, as with the latter, is generally related to socio-economic status. Extended families are common. The lifestyle of much of the Coloured population is characterised by poverty and a lack of suitable housing. While many affluent families live in large, modern, and sometimes luxuriant homes, most urban Coloureds rely on state-owned economic and sub-economic housing. These residential units are generally very small, and as there is also a shortage of homes, slum conditions often occur in neighbourhoods consisting mainly of sub-economic homes. The situation leads to general dissatisfaction and high rates of crime and alcoholism. There are many singing and choir associations as well as orchestras in the Coloured community. The Eoan Group Theatre Company performs opera and ballet in Cape Town. The Kaapse Klopse carnival, held annually on 1 January in Cape Town, and the Cape Malay choir and orchestral performances are an important part of the city's holiday season. Kaapse Klopse consists of several competing groups that have been singing and dancing through Cape Town's streets on New Year's Day earlier this year. Nowadays the drumlines in cheerful, brightly Coloured costumes perform in a stadium. Christmas festivities take place in a sacred atmosphere but are no less vivid, mainly including choirs and orchestras that sing and play Christmas songs in the streets. In the field of performing arts and literature, several Coloureds performed with the CAPAB (Cape Performing Arts Board) ballet and opera company, and the community yielded three major Afrikaans poets the well-known poets, Adam Small, S.V. Petersen, and P.J. Philander. In 1968, the Culture and Recreation Council was established to promote the cultural activities of the Coloured Community. Until 1841 missionary societies provided all the school facilities for Coloured children. In that year, the state made a financial contribution to Coloured Education for the first time. Since 1980, all children between the ages of 7 and 16 are obliged to attend school, and in 1981 there were more than 70000 pupils in primary and secondary schools. There are also many other educational establishments for Coloureds. For example, the state supports about 85 nursery schools and a training centre for nursery school teachers, several schools for the deaf, the blind and otherwise disabled children, as well as primary and secondary adult education. In addition to a number of multi-purpose secondary schools offering technical courses, there are also 5 technical colleges, a secondary school that trains hotel industry pupils, a seafaring training centre and a car mechanic training centre. Teachers are trained at about 15 colleges and a technikon, as well as at the University of the Western Cape in Bellville South near Cape Town. The university, of which Professor Richard van der Ross was the first Coloured Rector, was established in 1960 as a college college to meet the exclusive needs of the Coloured community and became a full-fledged university 10 years later. There are programs in literature and philosophy, science, economics and management science, law, education, dentistry and theology. Coloured students wishing to follow courses not offered at the university can enrol at other universities. Initially, the Coloureds were mainly semi-skilled and unskilled labourers who, as builders, masons, carpenters and painters, made an important contribution to the early construction industry at the Cape. Many were also fishermen and farm workers, and the latter had an important share in the development of the wine, fruit and grain farms in the Western Cape. The Malays were, and still are, skilled furniture makers, dressmakers and coopers. In recent years, more and more Coloureds have been working in the manufacturing and construction industry. There are still many Coloured fishermen, and most Coloureds in the countryside are farm workers and even farmers. The largest percentage of economically active Coloureds is found in the manufacturing industry. About 35% of the economically active Coloured Women are employed in clothing, textile, food and other factories. Another important field of work is the service sector, while an ever-increasing number of Coloureds operate in administrative, clerical and sales positions. All the more professional and managerial posts and posts are. In order to stimulate the economic development of the Coloureds, the Coloured Development Corporation was established in 1962. The corporation provides capital to businessmen, offers training courses and undertakes the establishment of shopping centres, factories and the like. Numerous South African cuisines can be traced back to Coloured people. It is said that bobotie, snoek based dishes, koeksisters, bredies, Malay roti are staple diets of Coloureds and other South Africans as well. Most dishes are passed down for many generations. ^ "The Coloured people group are reported in 17 countries". Retrieved 7 July 2016. ^ "P0302 - Mid-year population estimates, 2018". Statistics South Africa. 23 July 2018. Retrieved 18 April 2019. ^ "Namibia" CIA World Factbook. Retrieved 22 July 2016. ^ "Zimbabwe Population Census 2012" (PDF). Zimbabwe National Statistics Agency (ZIMSTAT). October 2013. Archived from the original (PDF) on 1 September 2014. Retrieved 16 February 2015. ^ Milner-Thornton, Juliette Bridgette (2012). The Long Shadow of the British Empire: The Ongoing Legacies of Race and Class in Zambia. Palgrave Macmillan. pp. 9–15. ISBN 978-1-349-34284-6. ^ Calafell, Francesc; Daya, Michelle; van der Merwe, Lize; Galal, Ushma; Möller, Marlo; Salie, Muneeb; Chimusa, Emile R.; Galanter, Joshua M.; van Helden, Paul D.; Henn, Brenna M.; Gignoux, Chris R.; Hoal, Eileen (2013). "A Panel of Ancestry Informative Markers for the Complex Five-Way Admixed South African Coloured Population". PLoS ONE. 8 (12): e82224. doi:10.1371/journal.pone.0082224. ISSN 1932-6203. PMC 3869660. PMID 24376522. ^ "coloured". Oxford Dictionaries. Oxford University. Retrieved 14 April 2014. ^ Posel, Deborah (2001). "What's in a name? Racial categorisations under apartheid and their afterlife" (PDF). Transformation: 50–74. ISSN 0258-7696. Archived from the original (PDF) on 2006-11-08. ^ Schmid, Randolph E. (April 30, 2009). "Africans have world's greatest genetic variation". Msnbc.com. Archived from the original on 2009-05-02. Retrieved 2009-10-23. ^ Tishkoff SA, Reed FA, Friedlaender FR, et al. (April 2009). "The Genetic Structure and History of Africans and African Americans". Science. 324 (5930): 1035–44. doi:10.1126/science.1172257. PMC 2947357. PMID 19407144. ^ a b c Quintana-Murci, L; Harmant, C; H, Quach; Balanovsky, O; Zaporozhchenko, V; Bormans, C; van Helden, PD; et al. (2010). "Strong maternal Khoisan contribution to the South African coloured population: a case of gender-biased admixture". The American Journal of Human Genetics. 86 (4): 611–620. doi:10.1016/j.ajhg.2010.02.014. PMC 2850426. PMID 20346436. ^ a b c Schlebusch, CM; Naidoo, T; Soodyall, H (2009). "SNaPshot minisequencing to resolve mitochondrial macro-haplogroups found in Africa". Electrophoresis. 30 (21): 3657–3664. doi:10.1002/elps.200900197. PMID 19810027. ^ Census 2011 Municipal report: Western Cape (PDF). Statistics South Africa. 2012. ISBN 978-0-621-41459-2. Retrieved 30 November 2016. ^ "1950. Population Registration Act No 30 - the O'Malley Archives". ^ a b Palmer, Fileve T. (2015). Through a Coloured Lens: Post-Apartheid Identity amongst Coloureds in KZN (PhD). Bloomington, Ind: Indiana University. hdl:2022/19854. ^ Deumert, Ana (2005). "The unbearable lightness of being bilingual: English–Afrikaans language contact in South Africa" (PDF). Language Sciences. 27 (1): 113–135. doi:10.1016/j.langsci.2004.10.002. ISSN 0388-0001. ^ "The Vibrant, Colourful, Coloured People". Encounter.co.za. 2011-09-17. Retrieved 2012-08-01. ^ de Wit, E; Delport, W; Rugamika, CE; Meintjes, A; Möller, M; van Helden, PD; Seoighe, C; Hoal, EG (August 2010). "Genome-wide analysis of the structure of the South African Coloured Population in the Western Cape". Human Genetics. 128 (2): 145–53. doi:10.1007/s00439-010-0836-1. PMID 20490549. ^ "Dr Abdullah Abdurahman 1872 - 1940". South African History Online. Retrieved 2009-10-23. ^ Welsh, David (2005). "A hollowing-out of our democracy?". Helen Suzman Foundation. Retrieved 2009-10-23. ^ Faull, Jonathan (June 21, 2004). "Election Synopsis - How the West was Won (and Lost) - May 2004". Institute for Democracy in Africa. Archived from the original on June 18, 2008. Retrieved 2009-10-23. ^ Abraham McLaughlin (May 7, 2004). "South African couples bridge racial divide". Christian Science Monitor. Wikimedia Commons has media related to Coloured people.